Simply Calphalon or Kitchen Aid KCH1S10KD ? First, I did not receive these products for free, I bought them. The Simply Calphalon was rated a best buy by CR and I thought that the specs for the Kitchen Aid made them worth consideration. 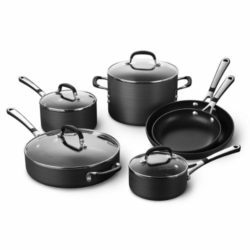 I have been in the restaurant business for over 30 years so I have a lot of experience with pans, mostly professional sets. So that is my point of reference. The Calphalon and Kitchen Aid were in the same mid-range price point (170 – 220) in November of 2015. Truthfully they are very similar but not equal.